The Hillsboro Recreation Commission and Devin Metzinger, Hillsboro High School head football coach, will provide a football camp July 9-11 for youth going into first through eighth grade at Joel Wiens Stadium. Assisting will be the HHS coaching staff and players July 9-11. The fee is $25 and each camper will receive a shirt. Times of the camp: 6-7 p.m. for first through fourth grade, and 7-8 p.m. for fifth through eighth grade. Campers will be instructed on basic fundamentals, rules of the game and terminology used by the high school program. The registration deadline is June 25 or the first 100 participants, whichever comes first. 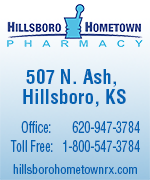 HRC programs now have online registrations at https://hillsboroks.recdesk.com/Community/ Home. You will be able to register for this activity on any computer, tablet or smart phone as long as you have a credit card or check card. For more information contact: Doug Sisk at 620-947-3490 or email to: recreation@cityofhillsboro.net. The Igloo, a shaved ice business on West D Street in Hillsboro, will host an opportunity to visit with the city’s new mayor, Lou Thurston, from 7-10 p.m. July 3. The invitation: “Come, have a Bigloo with Big Lou at the Igloo.” Partici­pants can purchase a $2.75 “Bigloo” treat for only $2. Zion Lutheran Church is sponsoring a vacation bible school from 6:30-8:30 p.m., Monday, Tuesday and Wednesday, July 9-12, at the church, 106 N. Lincoln St. This year’s theme is “Splash Canyons—Waters of Holy Baptism.” Children are invited to join the activities such as singing, games and snacks. Free fireworks and homemade ice cream will be offered at Aulne’s annual Independence Day celebration on Sunday, July 1. Entertainment and fellowship will begin at 7 p.m., followed by ice cream and desserts at 8 a.m..
A professional fireworks display at dark will com-plete the evening. Participants are encouraged to bring lawn chairs and bug spray. A donation will be accepted. The Hillsboro Museums has received a grant of $34,923 from the Heritage Trust Fund of the Kansas State Historical Society to repair the foundation and porch columns at the William F. and Ida G. Schaeffler House. The foundation at the southwest corner of the house and the footings for the porch columns had badly settled over the 108 years that the house has been in existence. Visitors are welcomed Tuesdays, Thursdays and Saturdays from 9 a.m. to noon and 1-3 p.m. Tuesdays Thursdays. 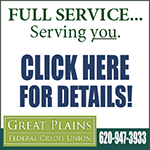 Call 620-947-3775 to make an appointment for a tour. Parkview Mennonite Brethren Church will welcome its new pastor and his family with an installation service Sunday, July 8. Tom Byford, wife Nicole and their four children will be moving to Hillsboro from Carbondale, Ill., the first week of July. Byford earned his Master of Divinity from Lincoln Christian Seminary in 2008 and has 14 years of ministry experience. District Minister Tim Sullivan will officiate the installation during the Sunday morning worship service. Following the service, the community is invited to a welcome reception and dessert at 1 p.m. in the Parkview Activity Center. Marion City Library will show movies at 2:30 p.m. starting Wednesday, June 27, in the Santa Fe Room. The first movie is about animals that love to sing; it is rated PG and is 108 minutes long. The July 11 movie is about a mischievous rabbit hat loves to get into gardens. The movie is rated PG and is 94 minutes long. The movie on July 18 is out of the garden and into the great UnGnome with a special detective. It is rated PG and is 86 minutes long.